One of the nice things about waiting until after the holiday season gift giving is over to buy is the after christmas deals! We found some excellent buys on Everlast med balls and thought we would link you to them below. If you are in the market for a leather med ball, now is your chance to get a great deal on one. You even get free shipping! Cool. A vintage style Muhammed Ali ball for the same great discount. Excellent! Med ball workouts are great for developing speed and power. Read on to learn more. Medicine balls represent a long time tradition in sports training and performance enhancement. As a functional exercise tool it has few equals, and modern training applications have expanded the choices available and the ways they are used by athletes and fitness enthusiasts alike. The origins of the medicine ball can be traced to the early 1900’s with the brand Everlast. However, modern options have evolved to include rubberized medicine balls for slamming and plyometric work as well as a variety of soft exercise balls. Among the common brands seen on sporting goods shelves everywhere are the soft Everlast and Danskin ball, and models by Gold’s Gym, Valeo and TKO. Training with medicine balls can increase power (explosiveness,) strength to a degree and endurance, but different models should be considered for different exercises. A soft medicine ball is best for solo workouts or workouts with a partner. When practicing reactive throwing drills with a partner, the soft vinyl or leather is easier to absorb repeatedly and hold onto. A rubberized exercise ball is a better choice for doing plyometric work with a rebounder (angled trampouline.) Rubber is also the only practical option for doing ball slams or throwing against a wall. Here are two choices in each category, priced at opposite ends of your budget; and in this case, more money does mean better quality. Everlast medicine balls are affordable and good quality. These are designed for exercises such as the seated or standing Russian twist and other core exercises. They are also ideal for throwing drills with a partner. Not for slamming. In our tests it only took 3-5 slams to bust a seam wide open. The ball can get a little slippery, but it is usually a temporary annoyance. Everlast seems to have addressed this problem with their latest Power Core ball that has textured panels for better grip, which is listed below. Start with the 9 pound ball unless you have already been working at this weight. 9 pounds feels much heavier when someone heaves it at you as hard as they can. The excellent products produced and sold by the former coaches and owners of Dynamax leaves no doubt about their dedication. The Dynamax website is filled with practical, informative content which leaves the reader feeling like an expert on medicine balls by the time they’ve finished. That said, this is a soft ball sold in weights from the 4 pound “Stinger” to the 20 pound “Burly,” in a unique selection of custom colors. This is not a slamming ball, and the Dynamax warranty explicitly states that their products are not covered against this type of abuse. The warranty does cover defective seams which wear out after normal use. Institutions (schools, sports facilities, etc.) get 2 years and individuals have 3 years of protection for their Dynamax medicine ball. The rubberized TKO medicine ball is available in weights from 2 pounds to 15 pounds. At 15 pounds, its use as an implement to increase power and endurance is limited, as is the practicality of using this for partner drills. However, they are inexpensive. Even the heaviest ball is under $50. As an inexpensive tool for increasing power and endurance for specific movement patterns, the best choices are from 2 to 8 pounds. The ball is designed for bouncing, so they are ideal for solo training sessions utilizing the wall, floor or a plyometric rebounder. Click on your preferred weight below to get the best price. The inexpensive Valeo brand has earned an excellent reputation for quality. After feeling the basketball like texture of this ball, it is easy to see why. The prices are in line with or slightly greater than TKO, depending on where you shop. The outer shell is constructed of sturdy rubber and designed to hold up to being bounced against hard surfaces. The textured grip is great and these are fun to play with. However, this is not the ideal choice for partner drills. 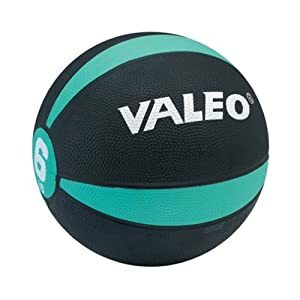 The Valeo medicine ball is readily available in sizes up to 12 pounds. Wash it down with soap and water when finished. Using too much weight for medicine ball exercises can alter the biomechanics of the movement, defeating the purpose of using them in the first place. Always choose a weight which allows the individual to execute the movement properly; even a light resistance will enhance power output and endurance. For best results, buy a selection of medicine balls in 2 pound increments from the soft and hard categories.